This piece of child's Irish jewelry is a History of Ireland expandable bangle that is cast in sterling silver. 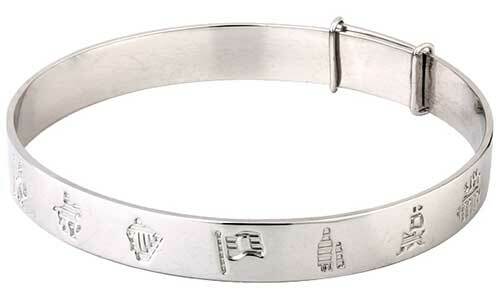 The child's size History of Ireland bracelet measures 1/4" tall and expands to a 2 1/4" opening. The History of Ireland bangle is an ideal keepsake gift for any child of Irish heritage and it is gift boxed with the legend booklet that explains the symbolism. The History of Ireland jewelry is made by Solvar Jewelry in Dublin, Ireland; it is available at The Irish Gift House. 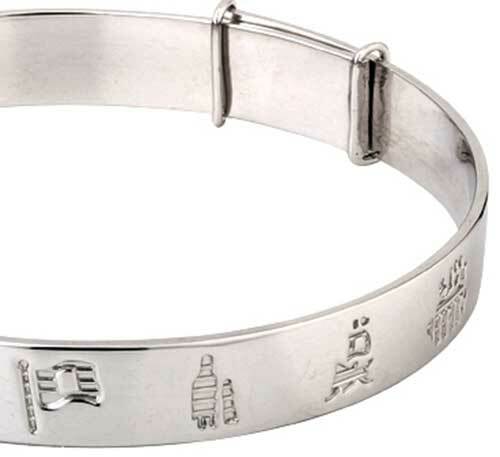 Irish baby bracelet is a sterling silver History of Ireland torc style bangle.